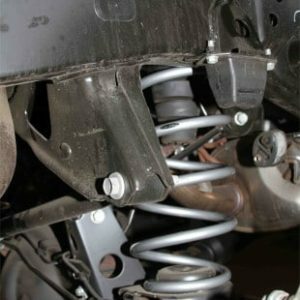 ICON’s 2010-UP Toyota 4Runner/FJ Cruiser Stage 5 suspension system provides a significant increase to the on and off-road performance of the vehicle. This system includes the components featured in the Stage 4 setup – ICON billet aluminum Delta Joint upper control arm kit, 2.5 Series Remote Reservoir rear shocks, 2” rear coil springs, and a tubular rear lower link arm kit – but sees the addition of extended travel 2.5 Series Remote Reservoir coilover shocks for balanced damping characteristics front to rear. The remote reservoir design allows for increased shock oil volume and enhanced cooling so that the rear of the vehicle can work harder for longer durations without noticeable “fade” occurring. The 2.5 Series Remote Reservoir rear shocks also feature ICON’s “Bump Zone” technology which significantly increases damping ability in the last 2” of compression travel, preventing harsh bottom-out sensation and giving the vehicle a much more controlled ride quality over varying terrain. ICON’s billet aluminum lower links are much stronger than the OE units, feature a greaseable dual stage bushing, and can be fine tuned on the vehicle with ICON’s double adjuster for optimum pinion angle. On top of it all, these links have been designed to provide correct roll steer geometry for the best possible handling on and off-road. This system features upper control arms with ICON’s patent pending Delta Joint. The Delta Joint is a heavy duty high angle ball joint that combines the durability of a ball joint with the performance characteristics of a traditional uniball. While the industry standard uniball does a great job of allowing the control arms of a vehicle to articulate with little bind, they do have an inherent weakness that leaves more to be desired when used in a daily driven application – exposure to the elements. The Delta Joint features a zinc plated housing providing the first layer of corrosion resistance, while a tough grease seal keeps potentially harmful elements out of the inner workings of the joint. Metal on metal construction and a greasable design increase the longevity of the Delta Joint while at the same time allowing for noise-free operation. What makes the Delta Joint unique is that it brings the best of both worlds to ICON upper control arms with features that make it more robust than a uniball, and at the same time capable of greater angularity than a typical ball joint.